We start off by calming our customer down and inquiring as to the extent of the damage. This isn't because we prioritize some emergencies over others, but rather so we can better prepare ourselves for the battle ahead. Then we make a point of reminding the customer that it's not their fault. Home emergencies due to flooding can both happen because of external factors such as Mother Nature's wrath as well as internal ones like a burst pipe. If possible, we always try to have the customer close off the source of the water. We might only take minutes to arrive (depending on your location), but these minutes can mean everything if a large volume of water flew through in the meantime. However, we'll always urge you to evacuate if we have reason to believe that the water is contaminated. Upon arrival, depending on the success of the last step, we'll either stop the flood first or assess the damage if the flooding already ceased. Once we know the extent of the damage, we can give you an upfront estimate of the cost and let you know how much work needs to be done – we'll also tell you the chances of salvaging certain parts of your home or the objects inside it. In certain cases, we might also move objects such as furniture outside of your home in order to protect it from further damage before we get to work. Thanks to our initial assessment, we'll know whether this step is necessary or if we are free to move onward to the water extraction process. We'll also take note of other subtleties – for example, a wet carpet might need to be removed before it ruins the floor underneath it. Now it's time to get down and dirty. 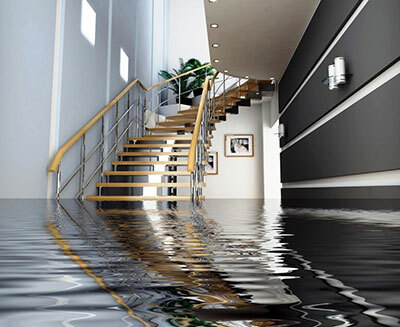 While the Great Flood in your home might have made you panic and despair, rest assured that our technicians remain calm and collected – we've been through this before, and we will help you get through every step of the way. Using our powerful extraction machines, we'll pump out all the water inside your home and the surrounding area. 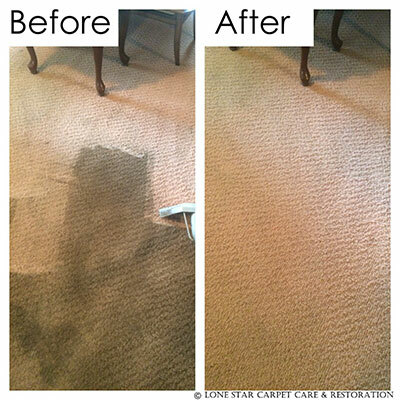 We'll make sure not even the smallest puddle is left standing – Lone Star Carpet Care and Restoration professionals know where to look, and they'll look as many times as needed until they're sure the job is done. Once the bulk of the water is out, it's time to consider the extent of the damage. Here is where the water's contamination once again plays a key factor – if we deem the water to be 'black' (majorly contaminated), you might need to replace certain parts of your home to protect your own health. Here is where our cleaning expertise comes into play, as we'll know how to deal with any damage caused by contamination. If your surfaces can be cleaned, you can count on us for the job. Afterwards, the restoration process is set in motion. Based on our initial assessment, we'll restore what we can, and help you replace the rest. We'll also use dehumidifiers to dry out every last bit of your home as mold can quickly form if this process is overlooked. Lastly, depending on the cause of the flood, we'll give you advice on how to protect yourself from further incidents – this could mean better protection from elemental flooding or having a plumber check each and every pipe and drain inside your home.